It’s been called Atlanta’s “most spirited and eclectic” street festival, and it’s our personal favorite here at Atlanta On The Cheap. The Inman Park Festival takes place each year during the last weekend of April — which is Saturday, April 27th and Sunday, April 28th this year. As always, this year’s Inman Park Festival includes a Tour of Homes, which kicks off on Friday, April 26th. Tickets are $20 in advance, and $25 on tour dates. Admission to the festival, including the parade, kids’ zone, and the live entertainment, is always FREE. There is plenty of food for sale on site. As always, the marketplace is a big draw, allowing you to shop for arts, crafts, vintage items, and more. Tour of Homes preview — noon to 4 p.m.
Tour of Homes — noon to 6 p.m.
Festival hours — 11 a.m. to 8:30 p.m.
Festival hours — 11 a.m. to 6 p.m.
Due to a city ordinance, no animals (other than service animals) are allowed on festival ground. PLEASE do not bring your pet and expect an exception. There are porta-potties and ATMs on site. Bicycles and scooters are not allowed within the festival grounds, but there are several bike valets where you can safely park a bicycle (more info below). There is very little parking in the Inman Park area. If you thought Dogwood Festival parking was tough, consider that this old neighborhood has none of the multi-level parking decks that are common to midtown. TIP: See our section on “Getting There” below. As always, the vendor booths are a festival highlight. The Arts & Crafts Market is a jury-selected group of more than 150 artists, who will showcase their work in various art forms. The Street Market is home to over 250 vendors selling antiques, handcrafted wares, clothing, and a large variety of other items. This parade is an Atlanta favorite! It is quirky, eclectic, unstructured, and downright fun. The parade starts at 2:00 p.m. on Saturday, in the area of Edgewood and Spruce Streets. It heads northeast on Edgewood, turns left on Hurt Street, then makes a right onto Euclid Avenue. You can view the parade route online. The Delta Park Stage — Near the intersection of Edgewood Avenue and Delta Place. Delta Park is a small greenspace that is bisected by Edgewood. The Freedom Stage — On the edge of Freedom Park, near the intersection of Euclid Avenue and Waverly Way. The Euclid Avenue Stage — At Euclid Avenue where it intersects Springdale Park. The music starts at 11:45 on Saturday and at 12:30 on Sunday, with bands switching up about every hour. For the complete musical line-up, visit the festival’s music page. A dedicated play space in Springdale Park includes not only the existing park playground, but special activities and crafts — including the chance to join a circus. It’s all FREE. If you love to peek at the lives of others, you’ll adore this inside view of intown living. The tour is self-guided and you can set your own pace. Home Tour tickets are $20 in advance. If you buy online, there’s a $2.29 fee tacked on. On tour dates, you’ll have to redeem your online ticket for the official Home Tour passport booklet at one of three ticket stations marked on the festival map. Starting at noon on Friday, April 26th, advance sales end and prices increase to $25 at these locations. To get a photo preview of the homes on this year’s tour, visit the Tour of Homes page. Most years, historic Inman Park Methodist Church is on the tour, and is open to the public, no ticket needed. If that’s the case again this year, don’t pass by without going in! You can NOT bring a car into the Inman Park neighborhood on festival weekend, and you can’t park at the nearby business establishments. PLEASE leave the car at home! There are plenty of good options for getting to the festival, and we have them all listed here. Remember, you can take your bike on a MARTA train. 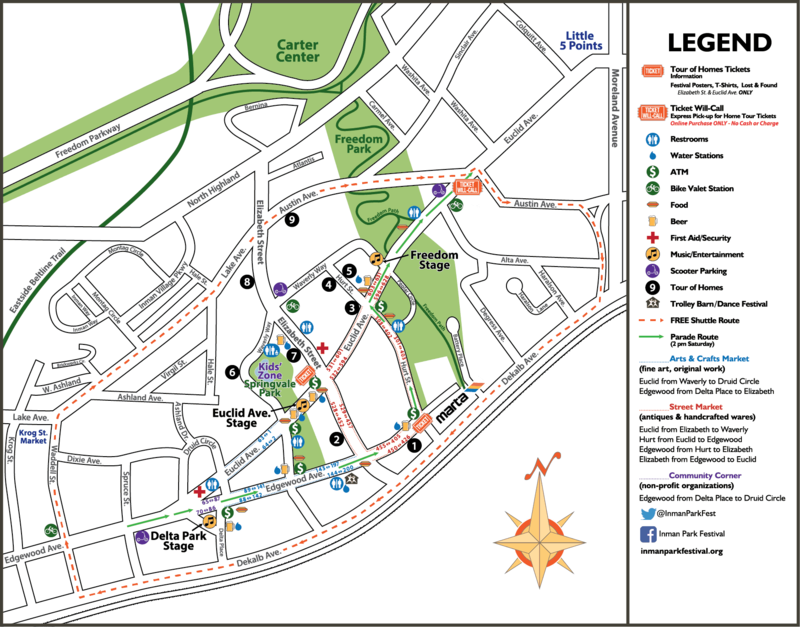 View the festival map online. One of our favorite tricks is to park at the Carter Presidential Library, cross Freedom Parkway, and walk through Freedom Park to get to the festival. It’s less than half a mile to the nearest edge of the festival grounds — no more than a six or ten minute walk. If you live along the Beltline’s Eastside Trail and don’t mind a longer walk, it’s an easy path to Irwin Street, which turns into Lake Avenue, which turns into Austin Avenue — which leads right into the festival. You can be dropped off just outside the festival area. It might be trickier being picked up on your way home — we recommend getting outside of the crowded area and waiting for your driver by a landmark s/he can find easily.. Seriously, folks, this couldn’t be easier. The Inman Park MARTA Station is right at the edge of the festival grounds — no shuttle needed. If you’re riding the Green or Blue Line, it’s a straight shot on the train, and you don’t have to transfer. If you’re on the Red or Gold Line, you’ll need to change trains at Five Points Station, but you can handle that, right? See MARTA’s guide to navigating Five Points Station, if you find it confusing. Alternatively, you can drive to a nearby MARTA station on the Blue/Green Line (Candler Park, Avondale, or East Lake) and park, then take MARTA just a couple of stops. Just be forewarned that parking at the stations fills up fast on festival days. There are two exits at the station — take the one for Inman Park (not Reynoldstown). When you exit MARTA, generally you can just follow the crowds to the festival (there are also signs pointing toward Inman Park. Remember that trains only run at 20-minute intervals on weekends. To time your trip so you’re not waiting, we recommend the MARTA on the Go app. Kids under 46″ tall can ride for free with a paying adult.